HH Brown 10" Original Military Jump Boots Midnight airdrops without blasting your budget. Serious military jump boots at a seriously low price. These HH Brown 10" Original Military Jump Boots are proudly made in the good old US of A and pack an old-fashioned value price. Lace them up with your BDUs and get ready for the action. 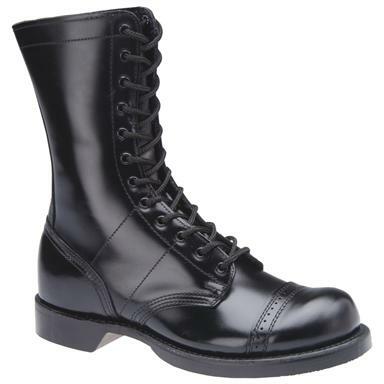 Each combat boot approx. 10" tall, 32 oz. Hit the order button on these combat boots before you hit the silk! State Size, as available in the Shopping Cart. Order ONLINE Today! HH Brown Mens 10 Original Jump Boots is rated 5.0 out of 5 by 3. Rated 5 out of 5 by HARLEY from QUALITY BOOTS USE THESE FOR WORK,,THEY HOLD UP FOR A VERY LONG TIME. Rated 5 out of 5 by dciurro from This is it. It's the real deal and it cost $100 less then anywhere else! I can not say enough about how wonderful these boots are. They served me well during 5 years in Civil Air Patrol, 4 years in ROTC, and 5 years in the Marine Corps (only in the field, the marines kind of frowned on my wearing Army jump boots). I bought my first pair in 1982 and they only just recently gave up the ghost. Because I compare every pair of boots to the perfect overall nature of these jump boots, there was no need to break them in. I work as a security officer and am on my feet more then I care to admit (I'm wearing them as I write this review). The support, comfort, protection, and outstanding appearance makes these boots the best in the world. Just my opinion...Ladder lacing is a must to get the full benefit of wearing jump boots. See attached photo. Rated 5 out of 5 by Charlie from Great boots When younger I wore jump boots all the time and they were so comfortable. These live up to the memory and were comfortable as soon as I put them on! I have narrow feet so thick socks are worn but they are still great boots!